A view of the Soča and the upper Sava river valleys spreads below Mount Triglav, Slovenia’s highest mountain. Lying between the two rivers is Triglav National Park, which protects numerous endemic animal and plant species in a region of high rocky mountains, deeply cut river gorges, high-mountain karst shafts, and attractive low mountains as well as the traditions of the once difficult life of mountain farmers and alpine dairymen. This is the area we shall be exploring, off piste and in a magical winter wonderland. Slovenia is ideal for Winter breaks as you will be able to enjoy Skiing, Snowshoeing, Snowboarding, Sledging, and the beautiful snow-capped mountain scenery, and the warm welcoming restaurants and bars of Kranjska Gora. 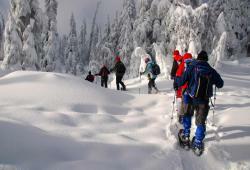 This itinerary is the perfect introduction to a fast growing Winter Sport… Snowshoeing!!! We are looking to explore the wild woodlands above the beautiful river valleys, and up on to the airy ridges with stunning views from up high. Be ready to hard physical work on this challenge. This is not an easy option ! 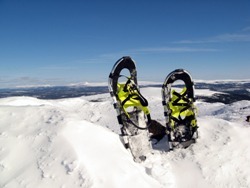 10:00 - 16:00 - Full days snowshoeing - beautiful woodland trail, with, subject to conditions, the option to ascend to local peak. For your entire trip you will be using a well equipped, modern, self catering apartment in Kranjska Gora which is one of the main trekking and adventure activity centres in this part of Slovenia. You will have clean comfortable rooms with bed linen provided and washing facilities in your apartment. The apartments are centrally located in Kranjska Gora, and within very easy walking distance of restaurants and bars. What is a Level 3.0 Winter Challenge Like? How Fit Do I need to be to join a Level 3.0 ‘Winter Challenge’? International Airfares - please ask if you require assistance with flights and we should be able to offer well priced flights with good connections. Excludes transfers in UK to airport (Lift Share may be available – expect to share costs on Parking at Airport). Certainly you should plan for cold conditions, although other factors to consider would be powerful sunshine, and maybe even rain (boo-hiss)... generally, as with all outdoors activities, you should be ready for anything.